Google analytics is a tool that can get you everything you want. More traffic and more subscribers. How many people know about my business? What content do people like the most? Where should I focus my SEO efforts? I’ve been there and I realised that I wasn’t going to find out these answers by guessing. This is why I recommend Google analytics, a ride or die tool that will help you make data driven decisions in your business. Instead of guessing whether your strategies are working or not, you can use google analytics to tell you what’s working and what isn’t working. 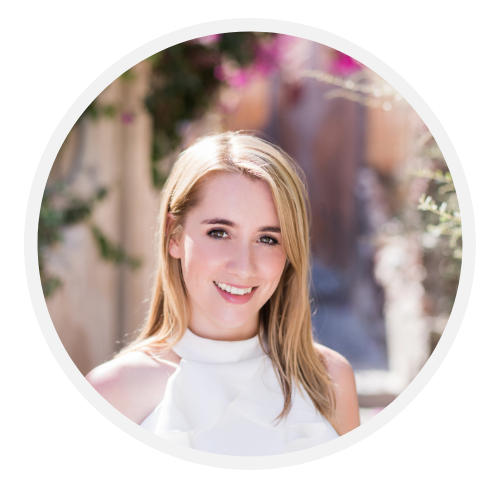 Let’s say you’ve created a pillar blog post that has a lot of views but you’re still not getting people signing up to your newsletter. You have a problem and you need to solve it. 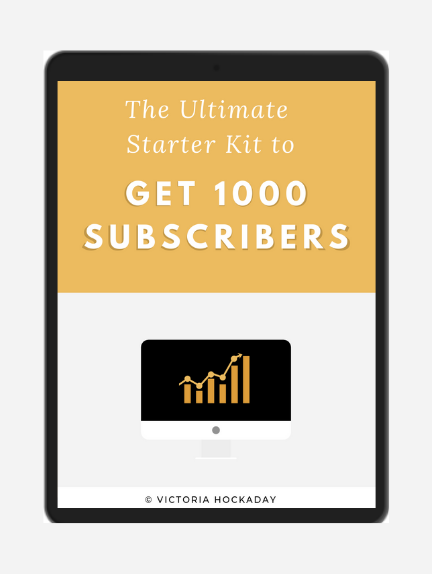 If you’re asking yourself “why am I not converting my traffic to subscribers? !”, the answer lies in google analytics. Do I sound like a broken record yet? Google analytics will help you to answer business questions so that you can make the necessary tweaks to your site. It might be that you have a high bounce rate on your blog post page. Essentially, this means people are leaving your site before taking any action. If this is the case, you’ll want to make tweaks to your page to decrease your bounce rate. 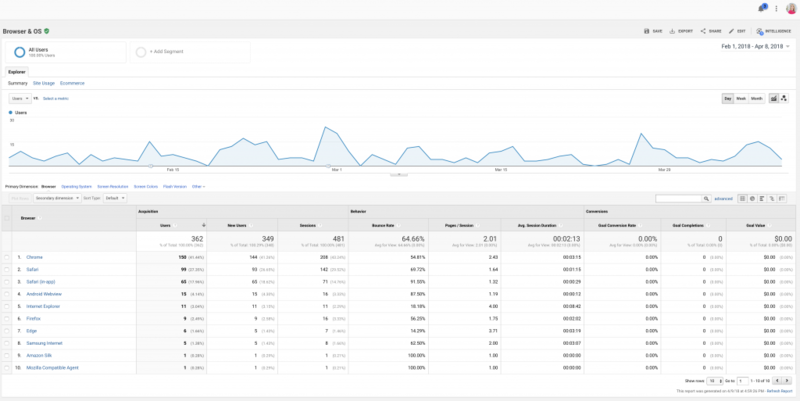 Today in my business, I use google analytics to track my traffic, measure my SEO efforts and increase my subscribers. If you are new to google analytics, you can watch my video tutorial here. 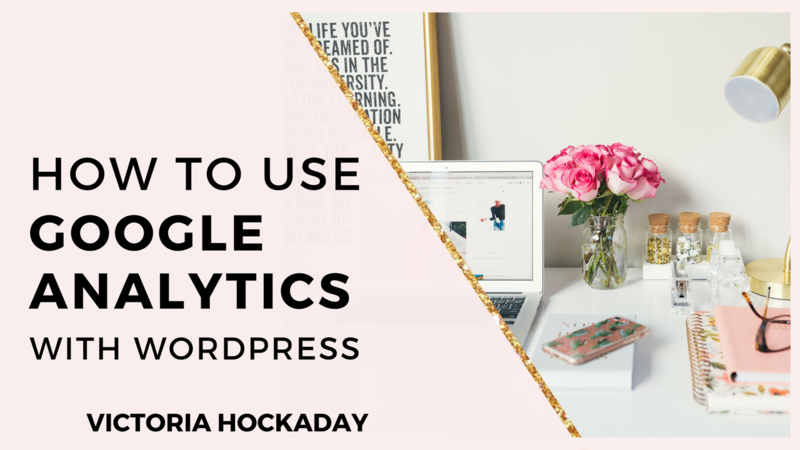 Here’s 8 ways to use google analytics with WordPress. You can look at the pie chart to find out where you’re getting the majority of your traffic from. For example, in my report you can see that I get most of my traffic from direct traffic. If you want to find out what’s happening on your site right now, you can use the real-time report. This is super fun and you can pretend you’re a detective for a short amount of time! Using real-time reports can be handy when you want to get a feel of the daily activity on your site. If you’re releasing a newsletter or you’re in the middle of a launch, you can use real-time reports to view the daily activity. Ever wondered about what countries you’re getting the most visitors? You can use the audience report to find out EXACTLY what the geography stats are. This will help you to see what countries you’re getting the most traffic from. For example, in the image below you can see that most of my views are from the UK. This can be particularly useful if you’re running Facebook ads to an event in your area and you want to see how your site is performing in that location. Bear in mind that your site is going to look different on different browsers. In the audience report of google analytics you can look at the top browsers people use to view your site. If you’ve created your site on one browser, you’ll want to test it’s performance on the other common browsers so that you’re not leaving anybody out. You can also use the audience report to find out what devices people are using to view your website. If you find that half of your viewers are using mobile, you’ll want to use google analytics to improve the performance on mobile. You can get a break down of the different mobile devices used to view your site. I’d suggest having a “testing day” when you get as many devices as you can in that office of yours and you test your site on different devices. 6 Is it Mobile Responsive? How do you know if your site is mobile responsive?! Well, this is where metrics on google analytics come in handy. If you want to find out whether your site is mobile responsive, you’ll want to compare the bounce rates between desktop and mobile. If your bounce rates are higher for mobile, you’ll need to make tweaks to your site to improve it’s performance. What are bounce rates? I hear you say.. Bounce rates show the percentage of people that have left your site without taking any action. Basically, if you have a bounce rate higher than 70% you’ve got issues..A bounce rate between 26%-46% is excellent, 41%-55% is average and 70%+ is poor. Any bounce rates above 70% are alarming, so if you discover it add optimisation a priority task on your trello workflow. One of my favourite things to do on google analytics is to look at the total page views on my site. This is rewarding when you’ve started doing YouTube or SEO and you can see the difference it’s making to your traffic. YAY. Another cool feature of google analytics is that you can use a date range to compare page views for different months, quarters and years. Say for example, you wanted to compare Q3 to Q4, you would insert the two different date ranges in the top right hand side and press “apply” to compare those quarters. Impressive right? If you’re ready to up your game, install google analytics and have a play! I’d love to hear from you. 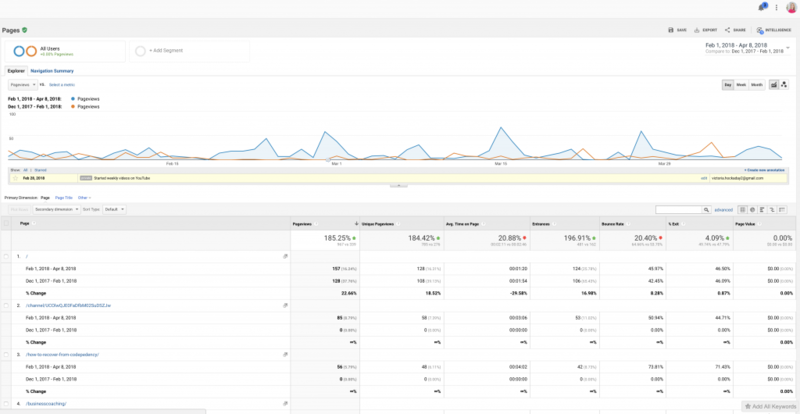 What do you think of google analytics?